Thank you for this opportunity to tell you a little about myself and my endeavors. I grew up in North Carolina, went to school in Colorado, then lived in Los Angeles for a number of years. During all that time I had not one stitch of quilting heritage. I started in a beginning quilting class about 17 years ago after I got married and we were living in central Ohio. When I told my instructor that I enjoyed the Dresden Plate the most out of all the blocks in the sampler, she told me, "You just might be an appliqué person." I still wonder whether that observation shaped my destiny, because it turned out to be so true! From that class on I was gripped with the quilt pox. For a long time I made quilts from patterns or pictures. Then I began to branch out, modifying designs in some way. We moved to Santa Cruz, California, and I got my own computer. When I learned some skills in illustrating, I finally broke through to creating original appliqué designs of my own. I can’t draw at all with my hands, but the computer gave me the tool I needed. I was taking some classes in digital media at my local community college, and just loved the information on typography and page layout that was presented in addition to learning the drawing programs. And so it happened that a peculiar combination of interests in my strange brain led me to become a publisher of books for quilters… quilting, computer illustration, writing, editing, typography, and page layout all combined! 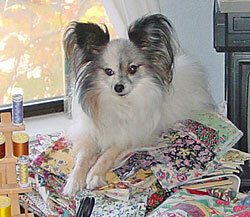 My company is Quilt Puppy Publications & Designs with six titles in print now. I fill every position! 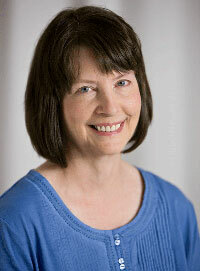 I’m the quilt designer, quiltmaker, writer, illustrator, book designer, and publisher. I’m accounts receivable, accounts payable, marketing manager, and the fulfillment department. (I’ve become an experienced bubble wrap wrangler.) There’s a Quilt Puppy blog too. My most famous books are Teapots to Appliqué (now out of print) and Teapots 2 to Appliqué. Quilters love teapots! I never thought I’d say this, but I’m also the webmistress of quiltpuppy.com. It’s amazing what you can learn when you’re interested and you roll up your sleeves. While you’re admiring my ‘coding skills’ over at quiltpuppy.com, be sure to check out my Giveaway For Kids. My appliqué blog is especially fun. All About Appliqué celebrates all forms of quilting appliqué. You’ll find lots of great information there, including some really great photo tutorials. There are also lots of links to other appliqué designers and pattern companies. Now for my newest news… I’m very excited to say that I have a book coming out from That Patchwork Place! 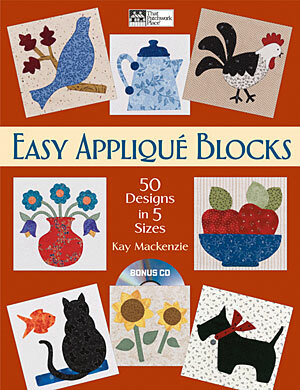 Easy Appliqué Blocks: 50 Designs in 5 Sizes is due out in early March. It’s a block book of 50 different designs in traditional, modern, and whimsical styles. The really cool thing is that there’s a bonus CD that includes all the blocks in five different sizes and also in reverse! You can choose your size and orientation and print everything right at home. No figuring of percentages or trips to the copy shop! Easy Appliqué Blocks also has illustrated instructions for freezer-paper hand appliqué, back-basting hand appliqué, and raw-edge fusible machine appliqué. This project has been three years in the making for me and I can hardly believe that it’s finally almost here! I have truly enjoyed being a part of the other side of publishing. If you’re at all interested in the process of writing a quilting book, you might enjoy my article series called A journey to a book at All About Appliqué. What does the future hold for me? I certainly hope it’s more to do with the two ingredients I love most… books and appliqué. I’m workin’ on it! Stay tuned! Appliqué for kettles always looks very attractive. Kettles really have a round shape perfect for the addition of fabric and materials. Thanks for the interesting post. 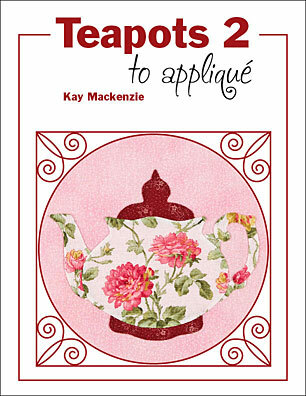 I am starting a class on applique and want to do Tea Garden in Kay MacKenzies Teapot Two. Is there a pattern available. Size, borders, etc.